Figaro (Joshua Hopkins) “fools around” with Rosina (Sandra Piques Eddy). Rossini’s Overture to the Barber of Seville is one of the most perfect pieces of music ever composed. It stays with you for the rest of your life. A quick listen of a few notes will remind you of the Bugs Bunny cartoon “The Rabbit of Figaro” or the movie “Breaking Away” with the young bicyclist racing down the roads of the American mid-west. But at the Vancouver Opera, when most operas leave the stage curtain down and simply play the overture, for this production the curtain was up and the characters of a 1940’s era movie backlot came on stage to move props around and attend to the wardrobe. One of the workmen even came onstage, opened his lunch bucket, and took out a carrot, in a comic sight gag nod to Bugs Bunny. Much more was to come, as this smallish three scene opera originally set around a barber shop in Seville, was made to fill the large stage that became a movie backlot full of visual delights. And when the overture was finished, there were about twenty men all standing on stage in their underwear. This opera can sometimes be a long one to sit through, leaving some who have seen it a few times before wanting to give it a pass. Kudos go to the VO designers and directors for a totally delightful and refreshing staging that keeps us entertained both musically and visually throughout. Barber of Seville reminds of me some of the Shakespeare comedies, such as As You Like It or All’s Well That Ends Well, because of the disguises and miscommunication that result in the comedic plot. In this Rossini opera, Rosina (now a young movie starlet) is overseen by Bartolo (now the movie director) who plans to marry her. But Rosina is also being wooed by Count Almaviva who assumes a number of disguises to woo her and be in her presence. Guess who wins the girl. 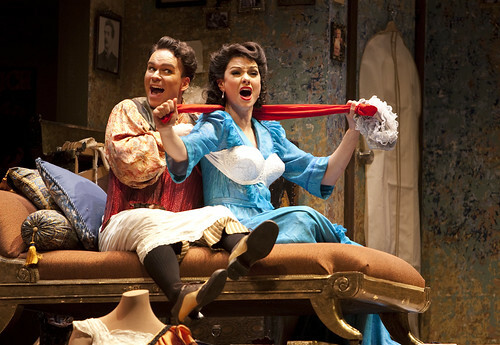 The character of Figaro the barber is both a matchmaker and mischief maker. He is sung brilliantly by Joshua Hopkins who is a crowd favourite. Sandra Piques Eddy plays Rosina, and is a flirtatious standout, easily reminding me of all the reasons why I fell in love with Italian-Canadian women. Rene Barbera as Count Almaviva is amazing especially with each costume change and disguise. Thomas Hammons has to play the villainous svengali of Dr. Bartolo, who was sometimes hard to hear, but his broad actions more than conveyed the comedic nuances well beyond the middle of the mezzanine. An all-North American cast performs this Italian opera, which was originally based on a trio of French plays by Pierre Beaumarchais. 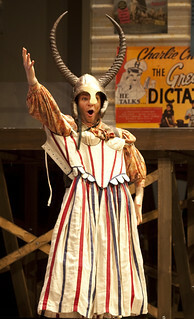 As a comedy, many of the lines are spoken rather than sung. This is one of the first times, I have really been able to pick out many of the words such as “Presto” and understand the action. I like to say that Italian is the 3rd language I have learned, having studied classical music, and sitting at the QE Theatre, I really wished that I was fluent in Italian to really enjoy more of the production. But it really is wonderful in any language. The surtitles translate the meanings of the conversation, complete with 1940’s idioms and dialect. The singing is excellent, the orchestra, lead by Robert Tweten, shines, and the music is some of the best ever composed. This entry was posted in Main Page on March 23, 2012 by Todd. City award to Jim Green. Jim really was a renaissance man. He loved opera, taught humanities, was a university lecturer, a union shop steward, a community worker and advocate, he was a two time city councilor, and a two time mayoral candidate. Here is a Feb 16th Georgia Straight article. 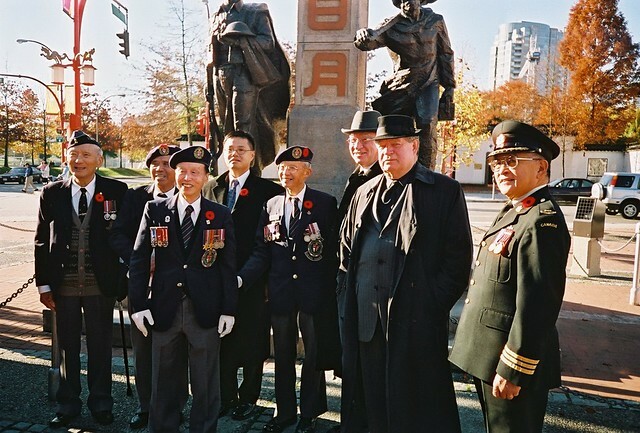 Jim Green and Larry Campbell, then councilor and mayor of Vancouver, pose for pictures with Chinese Canadian veterans of Pacific Unit 280, following a Remembrance Day ceremony November 11th, 2004. 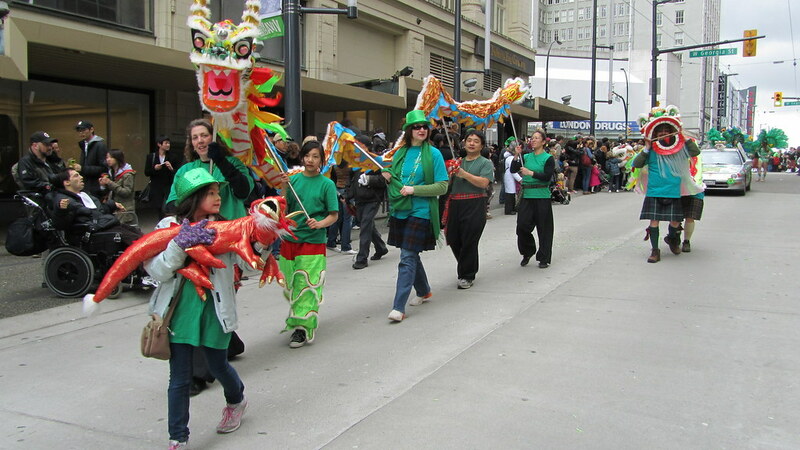 2nd from Left is Alex Louie, who just passed away on February 18th. 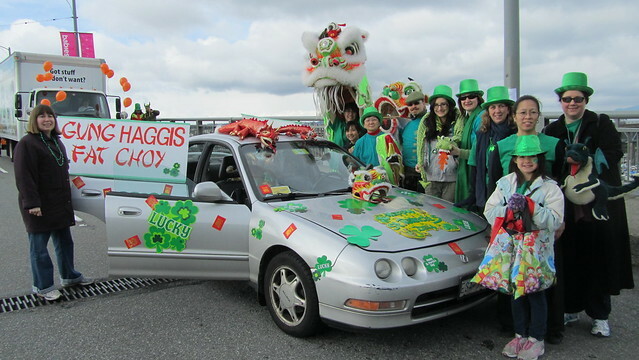 My Uncle Daniel Lee is 5th from left, between councilor Raymond Louie, and then mayor Larry Campbell – Uncle Dan passed away January 26th 2010. These Chinese Canadian veterans, joined the Canadian Armed Forces during WW2 when Canadian born citizens of Chinese ancestry were designated as “Resident Aliens” and unable to vote in the country of their birth. As a supporter of equality issues in Vancouver's Downtown Eastside and a City Councilor, it was fitting that Jim Green, originally an American draft dodger, came to honour their contributions to Vancouver society and history. evening – I did put a kilt on Jim Green, and we had haggis and scotch. 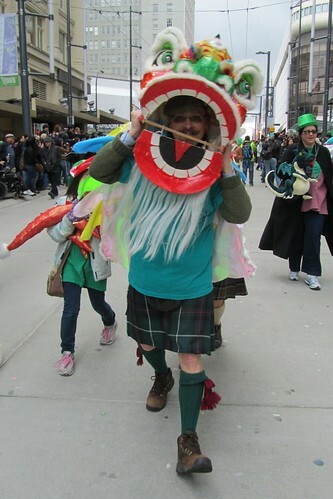 He had phoned me to give the Address to the Haggis at a whisky tasting fundraiser for MLA Jenny Kwan. Here is a story about Jim by my friend Tom Hawthorn, for the Globe & Mail. 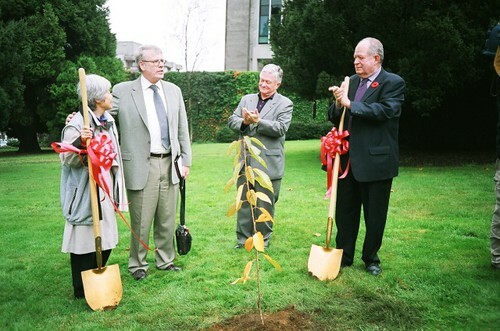 then he helped to plant a young tree at Vancouver City Hall in 2005. Back in October 2005, I had bumped into Jim at the 2nd annual Mayors' Arts Awards. He had asked how things were going, and I told him that Joy Kogawa's childhood home was now threatened with a demolition application. He was shocked, asking if I knew that City Council had just passed a motion to plant a cherry tree at City Hall and proclaim “Obasan Cherry Tree Day”. He then took the opportunity to speak to the audience at the Arts Awards to tell them about the campaign to save Kogawa House, which I had just gotten involved in at at the last week of September. Later in November, our Save Kogawa House committee when before City Council to ask for help, and they passed a motion to invoke a rarely used bylaw to delay the processing of the demolition permit. Jim played an important role that day, and gave us lots of support. Today we are now planning our 4th writer-in-residence program for Historic Joy Kogawa House where I am chair, and also on the board of The Land Conservancy of BC, which owns and maintains Kogawa House. Author Joy Kogawa, then Chief Librarian Paul Whitney, Vancouver Opera Manager James Wright, and then city councilor Jim Green, in November 2005. Joy and Jim performed the sod turning at Vancouver City Hall, for the planting of the “Obasan cherry tree” taken as a cutting from the cherry tree at Historic Joy Kogawa House. This entry was posted in Main Page on March 1, 2012 by Todd.